AVA has partnered with Safe Lives for their Spotlight #7: Domestic abuse and mental health which was launched today on mark World mental health day. Our Chief Executive Donna Covey CBE has written a blog highlighting the impact of violence and abuse on survivors mental health and need to create more trauma informed responses. It is clear from our work that services too often let women down. 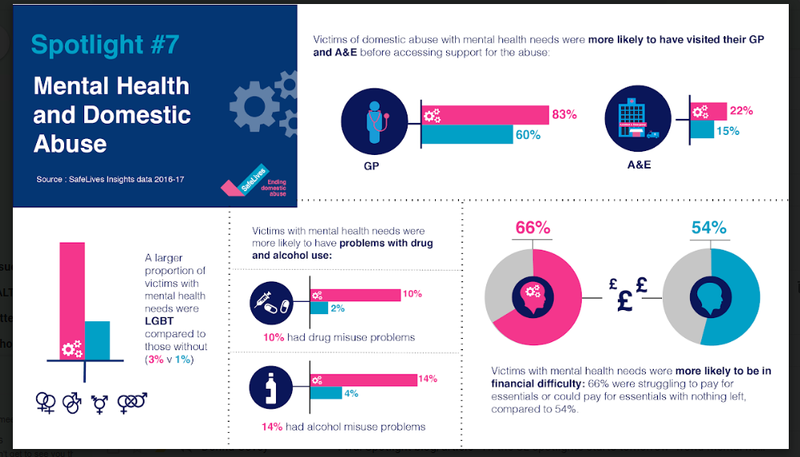 This spotlight aims to highlight the the fact that domestic abuse can have a severe and lasting impact on mental health, and that victims and survivors with mental health problems are more likely to have other complex needs. AVA work extensively on this area including developing our BARTA change management package to improve response and services for health trusts. We must see the whole picture for every victim, survivor and family so that everyone can be free to live the lives they want to live. Over the next month this spotlight will releasing a more blogs, podcasts and videos, including the latest research, practical resources and guidance. It would be great to get everyone to join the conversation on Twitter, using the hashtag #SafeAndWell. Please read Donna’s blog in full here. If you want to find our more about upcoming training on trauma informed practices please visit our training pages, and more information about BARTA and our other Mental health project is available here.